It was the good ol’ times all over again Monday night at AME Zion Church on the Hill. More than 30 people gathered to watch and discuss two locally produced documentaries that helped the audience reminisce about an older Harlem that was once a stomping ground for small Black-owned businesses. The films then offered a sharp contrast to these memories with images of a more modern, gentrified Harlem. The screenings were a summer edition of a larger initiative founded in March of 2011, “The Harlem/Washington Heights Education Film Screening and Community Discussion Series,” which works in conjunction with Total Equity Now (TEN), Community League of the Heights (CLOTH) and AME Zion Church on the Hill. The session on gentrification is the 20th event the three organizations have hosted together. 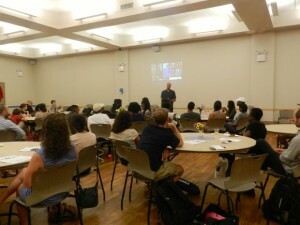 Joe Rogers Jr., founder of TEN, an organization that seeks to empower members of the Harlem community through education, said that he wanted to screen the films and allow attendees themselves to bridge the gap between two topics, gentrification and education, which are often discussed separately. To encourage this dialogue, Rogers pulled the attendees, who varied in age and race, into different groups after watching “El Barrio Tours: Gentrification in East Harlem” by Andrew Padilla and “Changing Face of Harlem” by Shawn Batey. The groups were asked to produce questions for the two filmmakers about the effects of gentrification and education, as well as allow an opportunity to build communities across the various backgrounds and neighborhoods from which they came. Yvonne Stennett, executive director of CLOTH, a 61-year-old organization that is committed to bettering the lives of southern Washington Heights residents, said that it was especially important for different people from different communities to come together to discuss these issues. “I think the forum created an environment for us to become activists and have community, and find solutions to the issues in our communities,” said Anderson, who has an interest in improving education. Meanwhile, Stennett closed the forum by emphasizing the importance of doing just that.